The big ship is called a Stimer [German phonetic for "steamer"]. The little boat which brings people to the big ships is called a sailboat. [I don't know whether that was what the boat actually was called in English, but that's how her word, Segel, translates. Every day she documented what she ate, which included such delectables as roasted (sometimes stewed) meats and fowl: beef, turkey, goose, and duck. She was served salads, soups, apples and oranges. Desserts like chocolate cream, pastries, vanilla cream custard, compote, a type of bundt cake, or ice cream might conclude the meals. 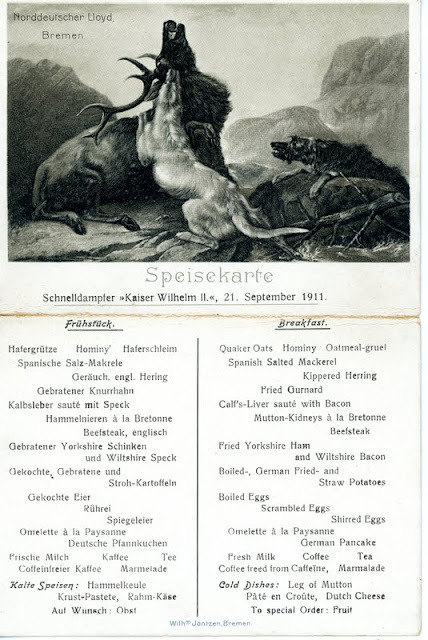 I paid 10 Pfennig for a postcard of the lunch menu to send to my sister. She bought a couple copies of the 9/21/1911 breakfast menu for herself as well. 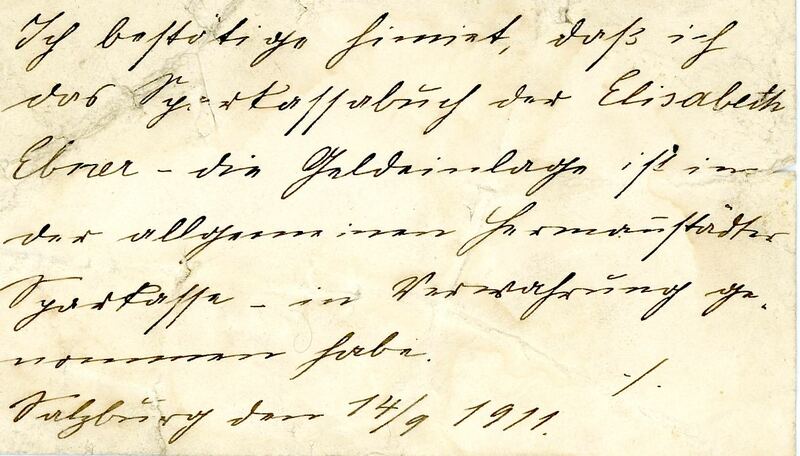 Written in German and English, it was formatted to be addressed, stamped, and mailed--or, in the case of this one, saved--for 100 years. See below. Check out the death scene at the top -- two wolves or wild dogs bringing down a terrified buck. Nature’s violence is something we twenty-first century sophisticates would rather not have to contemplate--especially at meal time. folded over the bottom and could be addressed and mailed as a postcard. I threw up a little and didn’t feel well, so I wasn’t hungry. On September 23, I bought a small teaspoon for 4 marks [German money]. 7 cents for 2 postcards for me and one for J.G. of New York. 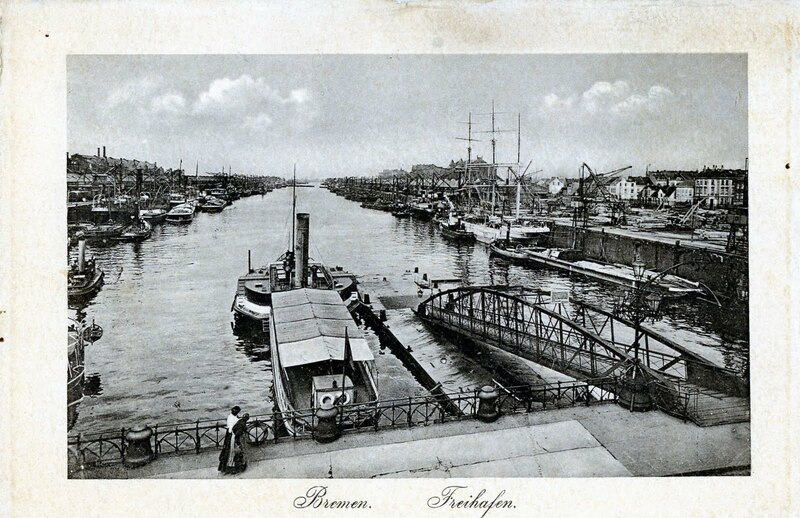 (See 7/19 post, Lisi's Moveable Feast to view Bremen/Bremerhaven postcards, which may be the ones she bought for herself). The postcard for J.G. [clearly Josef Gartz] must be this one. 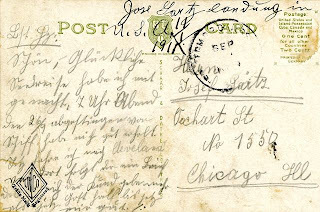 It's a scene in New York and addressed to Josef with a postmark of "September," and content that tells him she’s landed safely. 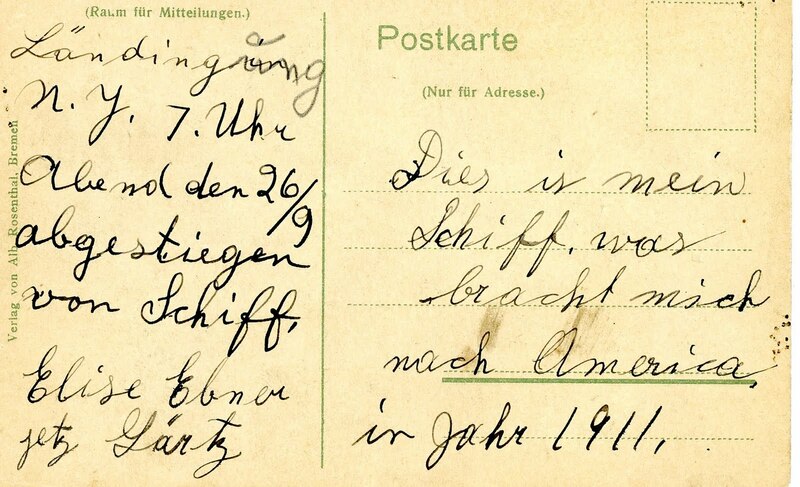 Before deciphering and translating her diary, I had assumed she bought the postcard in New York. Now I know its true provenance--from the ship. [Details coming up in a future post]. At some time in her life (not clear when), Lisi recorded the details of her arrival in New York on the back of this postcard of the Kaiser Wilhelm II, bought either on the ship or in Bremen. 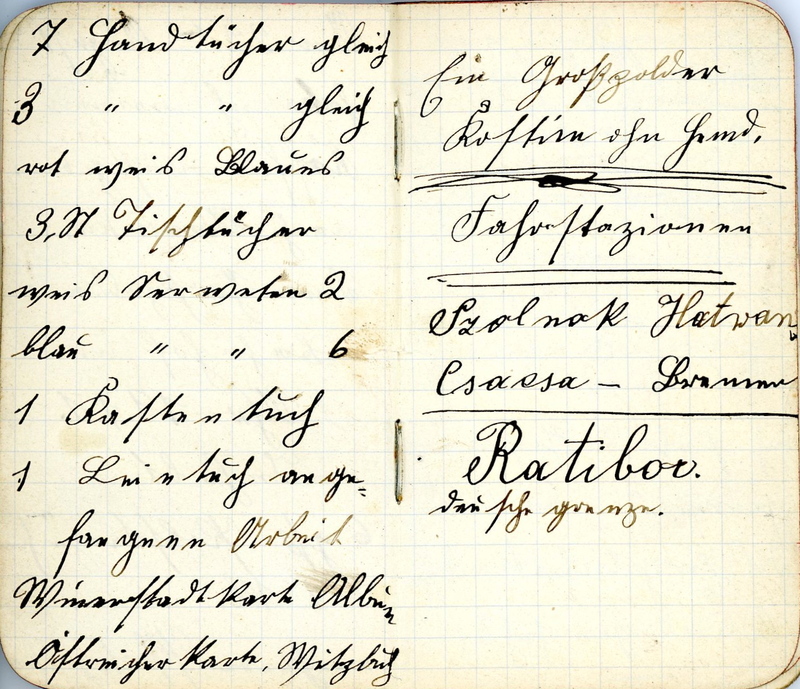 She wrote on the left side: Landing in N.Y. Disembarked from the ship at 7:00 p.m. on 26/9 (Sept. 26th) Elise Ebner, now Gärtz. (The "now Gärtz" tells me she made this note after her wedding. 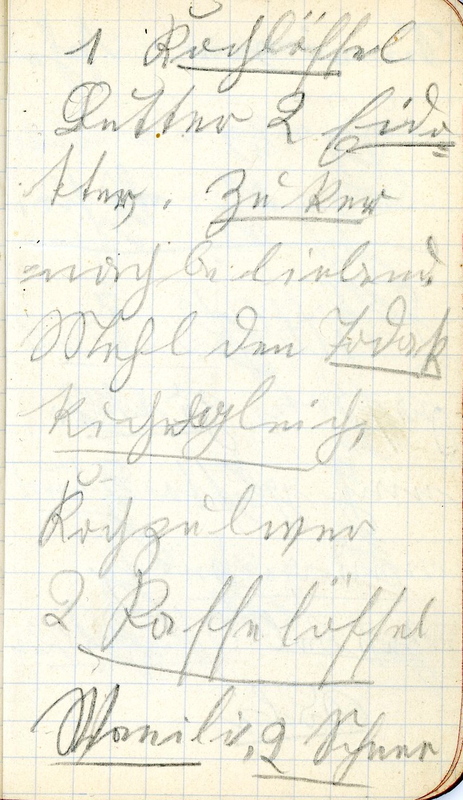 Another indication is that in her diary she noted the arrival time was 8:00 pm, meaning perhaps she misremembered the time by the time she made these notes. But close enough!). On the right she wrote: This is my ship that brought me to America in the year 1911. Kaiser Wilhelm II postcard, shown above left. 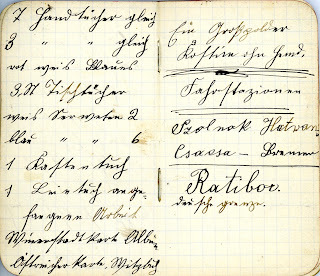 On the next post, Lisi arrives at Ellis Island in New York where the ship's manifest (passenger list) documents the details of the next destination on her journey. It wasn't directly to Josef. To find out where she went first, check back next week. Bremen, Germany, was the gateway for millions of emigrants from Central and Eastern Europe to American. So it was for my grandparents. 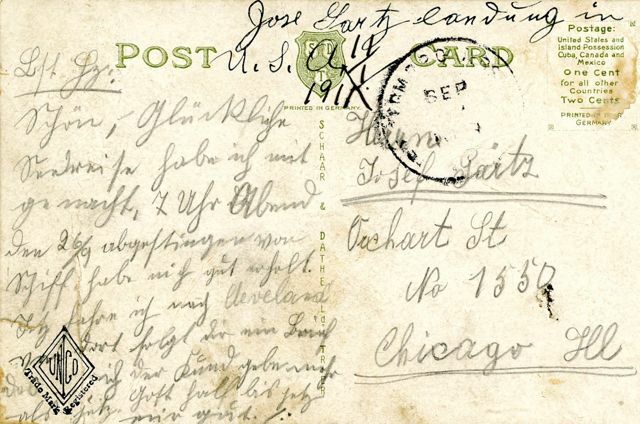 Josef had already left for America on New Year's Eve, 1910, and now was waiting for his sweetheart, Lisi, to join him in Chicago. Like Josef did nine months earlier, she was taking a train from the city of Bremen to the Bremen Port, Bremerhaven, about thirty miles south. These two postcards, mementoes in our archives which I assume she purchased during her stay a century ago, are the only clues I have of what she saw in those two days and three nights. 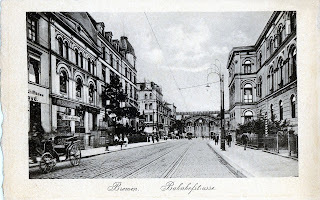 One depicts Bahnhofstrasse (literally, “Train Station Street”) in the heart of Bremen. The other is of Bremen Port. There she must have seen seagulls for the first time, and writes that “Seagulls look like doves, only bigger.” It’s the only comment she makes about her surroundings or the life-changing voyage she is about to embark upon. While it doesn’t surprise me that my grandmother, Lisi, didn’t write much of her emotions, (I remember her as an exceedingly practical person), I was struck by the contrast between her diary and that of my grandfather. 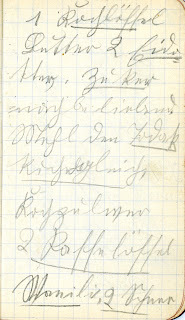 Grandpa's diary has given me an entirely new view of him. We always saw his joking, teasing, funny side, but through his letters and diary, I have discovered he was also romantic and in touch with his feelings. I was moved by sadness, joy, and fear as the mighty colossus pulled us far out over the waves of the great sea. Everyone on land waved after us with their handkerchiefs as they wanted to share with us a last and friendly farewell. They know such a trip deals with life and death, and we’re never certain if we’ll see each other again. (See Out to Sea). Lisi must have observed a similar scene when she boarded her ship, Kaiser Wilhelm II, but wrote nothing about it. 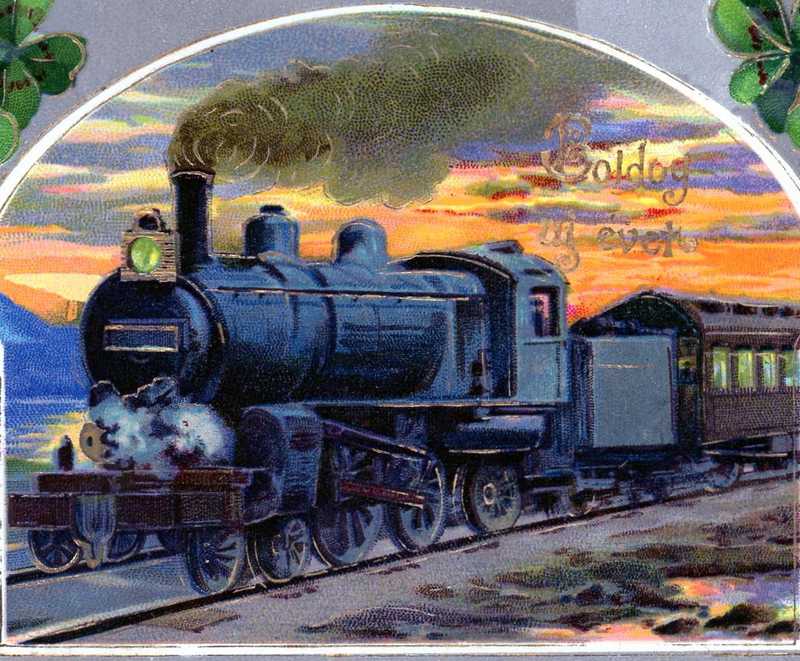 However, she did save this wonderful postcard of KWII, noting details of her arrival on the back (more on that coming up). 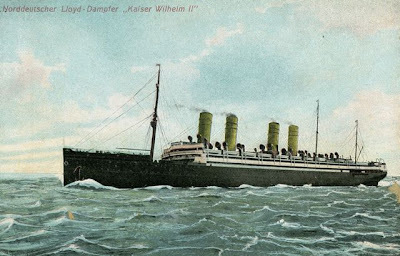 In the upper left is written: "Norddeutscher Lloyd Dampfer "Kaiser Wilhelm II." Norddeutscher Lloyd (North German Lloyd) was the shipping company that owned the ship. Dampfer means steamer. Once she was on the ship, Lisi again made no commentary on her experiences: whom she met, what the weather was like, what her fears or hopes were. Instead her diary is dominated by what she eats! As prosaic as that sounds, what these entries do reveal is what I believe is Lisi's amazement at the incredible quantity and variety of food she can choose from. It also shows that her ocean voyage was clearly at a higher class than that of my grandfather, Josef. He had traveled steerage (the cheapest ticket, in the bowels of the ship. No food included). Every day, Lisi compulsively recorded the food, drinks, and snacks she consumed. But she also noted several purchases, as she kept track of expenditures. Her desire to record and save details of her and her family's life, even if mundane, has been a boon to my ability to puzzle out my family's history. On the next post: the records Lisi did keep -- and the clues they provide to piecing together to the provenance of several century-old artifacts and documents. A century ago this summer, my grandmother, Elisabetha (Lisi) Ebner, was heading to America to meet and marry my grandfather, Josef Gartz. Her diary of the trip is often confusing because she intermixes train schedules, recipes, addresses, and meals. (See The Train Journey-Part I), but the important thing to me is that she actually recorded enough details, that I can follow along on her journey. Here's an overview map of the route she took, all noted in her diary: through the Austro-Hungarian towns of Budapest, Galanta, Trencin, Cadca; into Oderberg and Ratibor, the border town between Poland and Germany. She chugs along, noting the German towns of Breslau, Berlin, Hannover and finally to Bremen. to Bremen. From there she'll take a train to the port. Sept. 14, 1911, a clue Lisi had this note when she left. 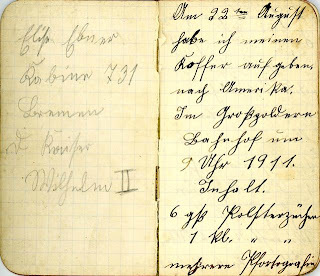 Lisi jots down the times she arrives and departs many of the cities as she wends her way to the port of Bremen. The dates she lists indicate that she personally left on the train several weeks after dropping off her luggage on August 22nd. (See that first entry at Farewell, My Homeland). The first date she lists of the actual train trip is September 15th, departing from Budapest at 6:50 pm. 9/16 Saturday: 2 a.m. arrive Oderberg; 2:30 a.m.
Our tickets are checked and we each receive a little piece of paper, giving us our seat number [on the next train]. -Her tips to every porter at each train station. -the cost of her room and the money she pays each worker at the "B and B" where she overnights in Bremen. 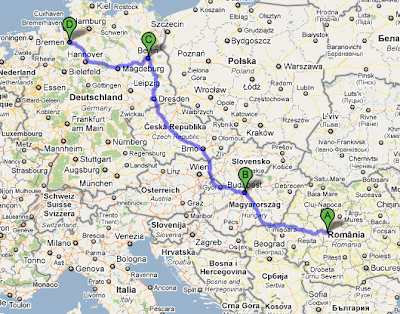 September 16th - 18th were the last three days she would ever again spend in Europe. This is it! The final leg of her train journey that will take her from the city of Bremen to the port--and to the ship that will carry her to America. At some time in these last few days, she learns of the ship on which she'll cross the Atlantic. 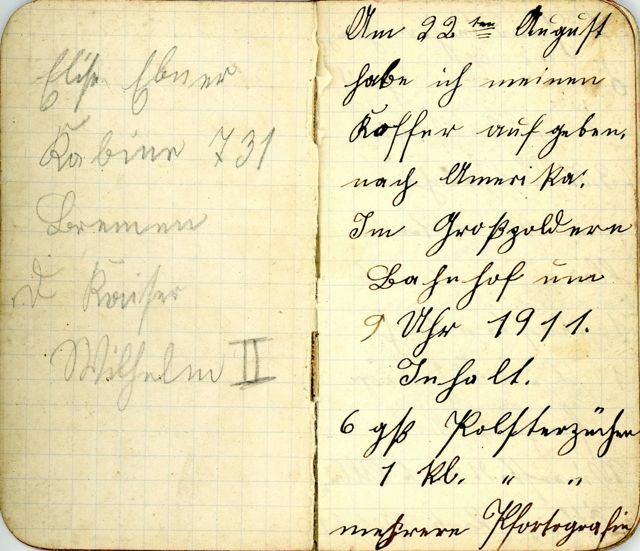 She enters its name and her cabin number--on the facing page of her diary’s first entry, which she had created on August 22, 1911. It's too important to be buried within. the "22nd of August" right. 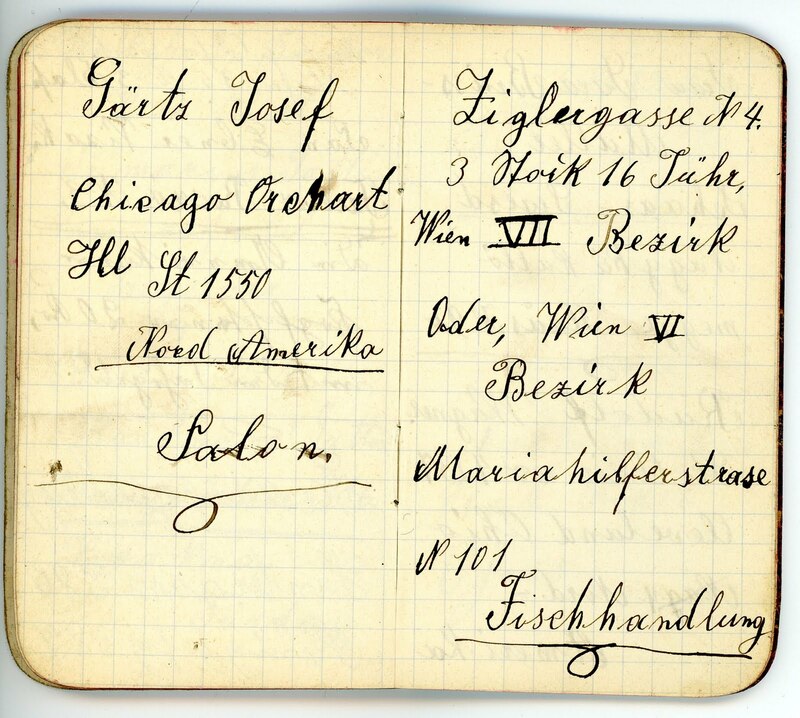 Coming up: Lisi starts a second diary--of her voyage across the Atlantic to America--closer to Josef’s waiting arms. 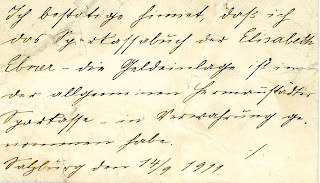 December, 1910, when he traveled toward Bremen. It’s a mixed up world in Lisi’s diary. She knew her trip to America would be the a journey of a lifetime, and she wanted to keep track of as much as possible. She wandered freely about her little black book, entering what she could -- often intermixing train schedules, recipes, addresses, and expenses. 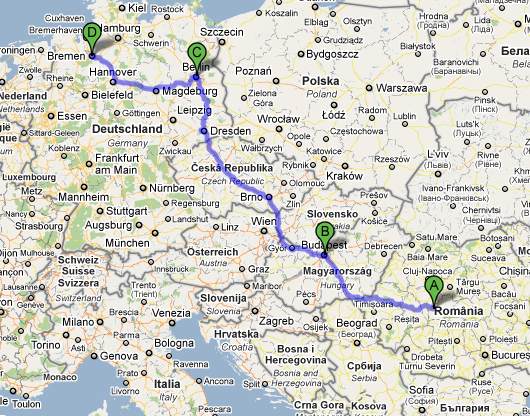 Nevertheless, with dates and details, the flow of her trip emerges. (See Mrs. Jickeli's employment recommendation for Lisi at the post: The Highest Recommendation). Among her hometown contacts I recognize the names of friends who later wrote her letters, which I have in my collection. Chicago addresses are thrown in throughout -- with phonetic spellings of street names and phone numbers. The latter were back in the day when an operator asked “Number, plee-uhs,” to connect a call. The caller gave her an “exchange” along with only four digits! Like “Kedzie 2500.” Lisi writes it “Ketzi,” as it sounds to her German language ear. 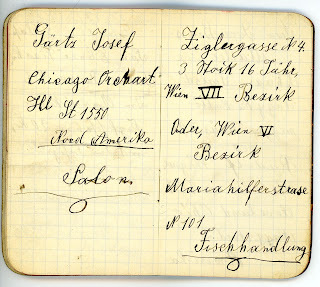 Of course, Josef Gartz's address is listed on Orchard Street in Chicago, where she had written to him that she was coming. (See: Are We Going There to Stay? Again the placement of street, state, address in America is totally strange to her. The train takes her on a journey like she’s never experienced. On the next post, I'll share with you Lisi's route, as she recorded it -- and some of the ways she spent her money. I welcome your comments. Just click on the word "comments" below. If you're having trouble, please send me an email at lindagartz@gmail.com to let me know. Welcome to another Carnival of Genealogy (CoG). It’s an opportunity for the genealogy blogosphere aficionados to strut their stuff on a specific topic. July’s topic is “The Seasons of Genealogy.” I’m approaching it metaphorically. See how my garden of "Family History Discoveries" has bloomed. The crocuses of family archives are just beginning to poke their heads out of the earth. Early March of my genealogy research, is, sadly, directly related to three deaths: of my grandparents and, later, their eldest son, who had lived with them his entire life. Uncle Bill died on January 1, 1990, and that’s when my brothers and I emptied out my grandparents’ house, and gave just a cursory look to what we discovered in their basement: plastic bags of letters, miscellaneous notebooks and scraps of paper; photo albums; needlework. We had no time to look at it closely, so we just hauled it all pretty much as we found it to my parents’ attic. Out of the coldness and sorrow of death, my family history came alive. My mother died in August, 1994. That’s when my brothers and I first realized the true extent of the family archives that had lain untouched for two decades and longer in my parents’ attic. We grouped what we found by categories into twenty-five bankers’ boxes, labeled each, loaded the van, and drove them off to storage. The daffodils of family history awareness were emerging. In 2000 I persuaded my brothers to come to Chicago to spend a week cataloging in greater detail what existed in our massive collection. As brother Bill and I pulled an artifact out of each box, my older brother, Paul, entered it into an Excel spread sheet. Now we had quick access for research. The boxes went into the second story of my heated garage. If each artifact were a daffodil, thousands were in glorious bloom, begging me to look at them. For two years those boxes nagged at me. 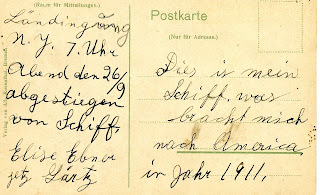 In 2002 I took the plunge and began reading the 250+ WWII letters as well as my parents’ oldest diaries. So began my journey into the past. I spent the next several years, as time allowed, reading and annotating the diaries, and writing chapters of family history. The tulips bloomed in my Family Research Garden. Fall of 2007, my brothers and I traveled to Romania (Austro-Hungary when my grandparents lived there). In their hometowns we discovered that the Gartz side of the family had originally come from Alsace, visited the original homes of both Dad’s parents, met relatives--as well as Professor Uli Wien -- who was researching a book about the Siebenbürgen Germans. 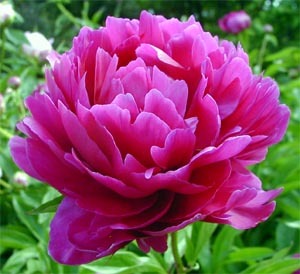 Showy peonies brightened the family history trail. Some links: Spilling Secrets. Searching for Home. It will take a while to move into the fall of my research, but I hope to do so as this year’s summer actually gives way to autumn. I’ve learned nothing can be overlooked, The most obscure business card can hold a treasure of information on the back, hiding its secrets in a scrawl of old German writing -- until I get it to Meta to decipher. The spreadsheet was a good beginning -- but details lurk within or behind every album, wallet, framed photo, and scrap of paper. Winter will be here when I donate all to a wonderful research library for all the world to access this historical trove.